Adobe LiveCycle ES4 HTML Workspace provides out of the box support for English, French, German, and Japanese languages. It also provides capability to localize HTML Workspace user interface to any other language. Localize text of the HTML Workspace. 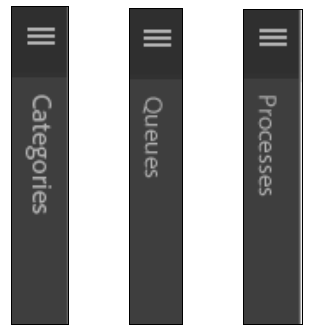 Localize collapsed categories, queues, and processes. Before performing above steps, ensure that you follow the steps listed at Generic steps for HTML Workspace customization. To change the language of the login screen of HTML Workspace, see Creating a new login screen. Perform the following steps to add support for a language New and the browser locale code nw. Log in to CRXDE Lite. The default URL of CRXDE Lite is http://[server]:[port]/lc/crx/de/index.jsp. Navigate to the location apps/ws/locales and create a new folder nw. Copy the file translation.json from the location /apps/ws/locales/en-US to location /apps/ws/locales/nw . Navigate to /apps/ws/locales/nw and open translation.json for editing. Make locale-specific changes to the translation.json file. The following examples contain the translation.json file for English and French locales of HTML Workspace. HTML Workspace uses images to display headers of categories, queues, and processes. You require development package to localize these headers. For detailed information about creating development package, see Building HTML Workspace code. In the following steps, it is assumed that the new localized image files are Categories_nw.png, Queue_nw.png, and Processes_nw.png. The recommended width of the images is 19px. To find the browser language locale code of your browser. Open http://[server]:[port]/lc/libs/ws/Locale.html. Using a WebDAV client, place the image files in the /apps/ws/images folder. Perform all the semantic changes listed in the Workspace Customization article. Navigate to the js/runtime/utility folder and open the usersession.js file for editing. You require development package to localize the datepicker API. For detailed information about creating development package, see Building HTML Workspace code. Download and extract the jQuery UI Package, navigate to <extracted jquery UI package>\jquery-ui-1.10.2.zip\jquery-ui-1.10.2\ui\i18n. Copy the jquery.ui.datepicker-nw.js file for locale code nw to apps/ws/js/libs/jqueryui and make locale specific changes to the file. Navigate to apps/ws/js and open the jquery.ui.datepicker-nw.js file for editing.